No. We are not talking about the series “Lost” or the game show “Survivor”. This is a matter a fact a new game from Net Entertainment. Lost Island is kind of a typical game from Net Entertainment. Some fancy symbols and nice graphics that is running smooth. Lost Island is kind of a straightforward game. Very easy to play and no extra bonus games that can be a bit confusing sometimes. Instead they have been focusing on the wild-symbols, scatter-symbols and the multiplicator that can release some extra cash with a bit of luck. 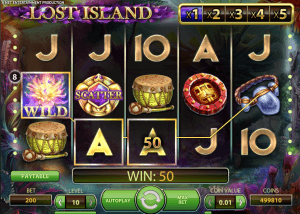 Three or more scatters on Lost Island get you free spins, like other slots from Net Entertainment. The highest payout is 500,000 coins. With a bet on €0.50 cent that would get you as for as €250,000. Not bad at all.